Our Paints & Coatings domain focuses on developments in both organic and inorganic paints & coatings materials. It is one of the most regulated industries. The paints & coatings industry has undergone several technological developments in past decades. Currently, application of nano-coatings has been the most opportunistic area of development in the market. Our report tracks latest growth drivers and restraints and regulations impacting the Paints & Coatings Industry. 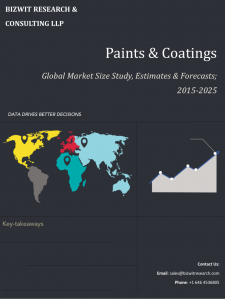 Some of our top selling advanced material reports are Global Automotive Coatings Market, Global UV Coatings Market, Global Nanocoatings Market and Global Sol-gel Coatings Market.